AMES — Steve Prohm has been saying for awhile that if his Iowa State basketball team can hold serve in the Big 12, the Cyclones will have an opportunity to play in March. 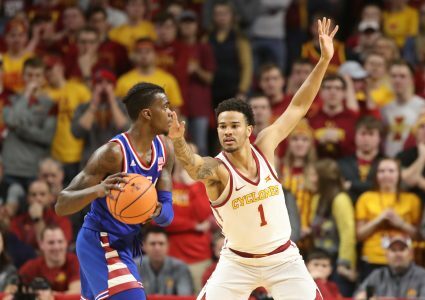 Following Friday’s 91-75 home loss to Kansas State in the conference opener at Hilton Coliseum, the Cyclones will now have to get a break somewhere along the way. Dean Wade poured in a career-high 34 points on 13-of-16 shooting and the Wildcats pulled away in the second half to snap Iowa State’s nine-game winning streak before a crowd of 14,384. It was the earliest league opener in school history for the Cyclones (9-3, 0-1), who face an uphill battle in their quest for a seventh consecutive NCAA Tournament berth. There were eight ties and six lead changes in an entertaining first half that ended with Kansas State holding a 53-50 lead. But while the Wildcats continued to scorch the nets in the second half, Iowa State struggled to find any offensive rhythm. The Cyclones shot just 23.1 percent in the second half (6-of-26) after shooting 68 percent in the opening half (17-of-25). They also finished with 13 turnovers. 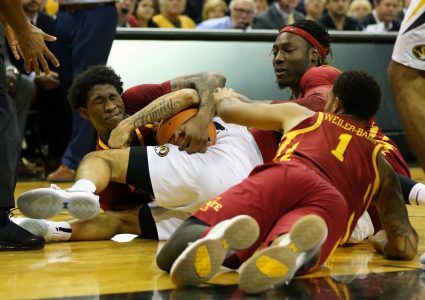 On the other end of the court, Iowa State simply had no answers for the Wildcats’ three-headed monster of Wade, Kamau Stokes and Barry Brown Jr. The trio combined for 78 of Kansas State’s 91 points. The 6-foot-10 Wade went 6-for-8 from behind the arc for the Wildcats (11-2), who finished 13-of-26 from 3-point range. He also had a team-high eight rebounds. Stokes scored 21 of his 23 points in the first half. Brown finished with 21 for Kansas State, which ended a four-game losing streak to the Cyclones. Freshman Lindell Wigginton led the Cyclones with 23 points. He became only the fourth Iowa State player to score 20+ points in his first conference game, but he made just 9-of-15 free throws. Solomon Young had a season-high 16 points, Nick Weiler-Babb chipped in 14, and Cameron Lard added 13 points and nine rebounds. But it wasn’t nearly enough on a night when leading scorer Donovan Jackson scored just two points on 1-of-5 shooting. 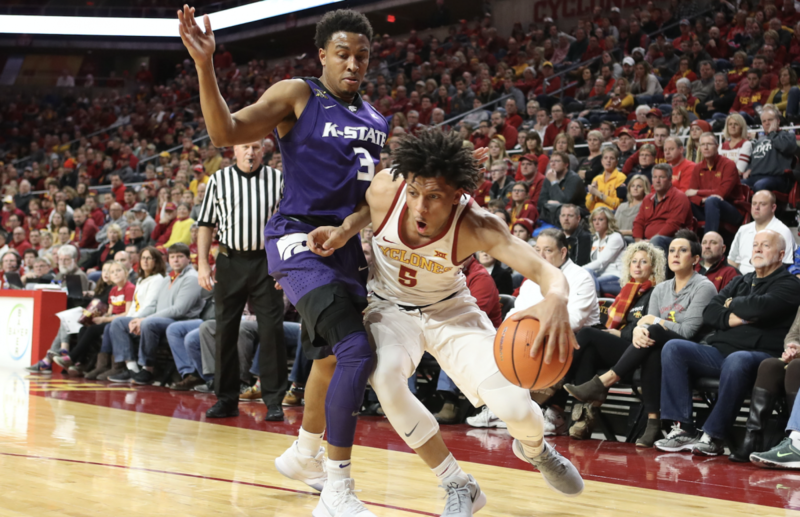 It was only one game, but in a loaded Big 12 that features six ranked teams– and Kansas State isn’t one of them – the Cyclones could find themselves in a precarious position. Monday’s home game against Texas becomes all the more important following Friday’s loss. “We’ve got to get as many home wins as we can, so that game is crucial,” Wigginton said. Jakolby Long returned to action for Iowa State after missing five games due to a concussion. He played 8 minutes and failed to score. The Cyclones were still without forwards Hans Brase (sprained ankle) and Zoran Talley (stress fracture). Prohm said Brase is questionable for Monday’s game, while Talley likely won’t return to practice for at least another week. “We do need to get healthy, but that can’t be an excuse,” Prohm said. Holm was the longtime sports editor of the Ankeny Register & Press Citizen before joining Cyclone Fanatic as a contributor. He also serves as the publisher of Ankeny Fanatic, which is scheduled to launch on Jan. 1. Holm graduated in 1988 from Iowa State, where he covered the Cyclones for the Iowa State Daily, the Cedar Rapids Gazette and the Des Moines Register. He spent most of his afternoons during college at Beyer Hall, hooping with Cyclone legends like Ron Harris and Lefty Moore. Now, he plays in a "D" league in Ankeny. Holm is a huge college basketball fan who will be attending his 12th Final Four in 2018. He's looking forward to the day when he can watch the Cyclones at the Final Four.